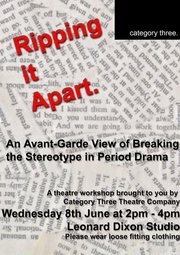 Workshop Based on an Avant-Garde View of Breaking the Stereotype in Period Drama. Being controversial usually implies that a theatre-maker has something important to say. When we deal with taboo, or unmentionable subjects we aim to explore difficult feelings and being controversial is one way of shocking an audience into understanding subjects from a different point of view. In this workshop we used scenes from a period playtext and aimed to rediscover the possibilities of these texts, through breaking stereotypical characters and pushing the boundaries of what is acceptable. What is it to be normal? How do we define being human, real or natural? This workshop demonstrated the work in progress under taken by Category Three in order to produce a new theory on theatre, which aims to renegotiate the relationship between audiences and performers as well as the wider context of the world surrounding us all.